Who is the most important out-of-contract player at your club excluding free agents? AFL.com.au looks at each club’s prominent uncontracted players – those with up to seven years’ service – and updates where things are at with their contract talks. Sign him up: Tom Lynch. The Crow forward might not be attracting the headlines of his Gold Coast namesake, but he has long been a vital member of the Crows' attack with his tireless work ethic and ability to play as a linkman. The Victorian is settled in Adelaide and the Crows' premiership window should remain open for some time. However, he and the club remain some way apart in their contract talks to date. Sign him up: Allen Christensen. The former Cat has made an encouraging return after missing the previous 18 months with recurring collarbone injuries. He has averaged nearly 20 possessions a game over the first six rounds, but has been held goalless over the past three weeks. Christensen is content to focus on returning to his best form for now, with serious talks unlikely to start until the second half of the season. Sign him up: Matthew Wright. The Blues have done a good job of securing youngsters such as Charlie Curnow, Sam Petrevski-Seton, Zac Fisher and Harry McKay to long-term deals, which leaves the 28-year-old Wright as their most valuable uncontracted player. The former Crow has not missed a game since crossing from Adelaide at the end of 2015 and has been a regular goalkicker for the Blues. Has re-signed on one-year deals the past two years and is likely to do so again later this year. Sign him up: Darcy Moore. The versatile tall shapes as one of the key planks of Collingwood's spine over the next decade. Trained with Collingwood's backline group this pre-season but has played predominantly as a key forward in his time at the Holden Centre, including the opening two rounds of this season. Remarkably athletic for someone standing 203cm, Moore's rare gifts make him an even more valuable re-signing than Jordan De Goey and Jamie Elliott. The son of Collingwood great Peter, it's hard to see him leaving the Magpies' nest. Sign him up: James Stewart. Most of Essendon's big names are signed beyond this season, which should make 2018 a relatively stress-free year for Adrian Dodoro and his list management team. James Stewart has been a handy addition to the Bombers' attack since crossing from Greater Western Sydney at the end of 2016 and leads the club's goalkicking with 12 after six rounds. The key forward said recently he had opened contract talks with the club and hoped to re-sign soon. Sign him up: Harley Bennell. In March, Dockers coach Ross Lyon said if Bennell got his act together off the field he would probably be re-signed beyond 2018 despite his on-going battle with calf injuries. Lyon is mindful the former No.2 draft pick is a rare talent who will make Freo a stronger team if he can get back on the park consistently. Freo will give Bennell time to return to fitness and form, but to earn another contract he will have to show he is finally ready to commit to the off-field discipline required at AFL level. Sign him up: Mark Blicavs. The 198cm utility is one of the Cats' most versatile players and has been solid in defence this year in the absence of injured key defenders Lachie Henderson and Harry Taylor. The former steeplechaser is one of the competition's elite runners but, at 27, he appears ready to settle in a key position if required. Blicavs and Geelong have opened talks and the Cat's manager and father, Andris, told AFL.com.au he didn't see "any problems" emerging that would derail a new deal. Sign him up: Kade Kolodjashnij. The dashing half-back is an undoubted talent, having finished runner-up in the Suns' best and fairest award in his second season, 2015. The Tasmanian's 2017 season was prematurely ended by lingering concussion after-effects, and he recently suffered another concussion after being dropped following round four. Kolodjashnij is yet to open talks with Gold Coast, with his immediate focus on returning to the senior team and regaining fitness and form. It's expected both parties will revisit things round the club's round 10 bye later this month. Sign him up: Jeremy Finlayson. After re-signing Toby Greene and Phil Davis earlier this year, the Giants are set for a rare quiet year on the contracts front, with Finlayson looming as their next priority. The fourth-year tall has been a revelation this season in defence. After playing just one senior game in his first three seasons, he has slotted seamlessly into the Giants' backline, averaging more than 20 possessions and four marks a game over the first six rounds. Sign him up: Daniel Howe. At 191cm, the versatile Howe has cemented himself in the Hawks' senior team over the past 18 months and, at 22, should be a valuable player over the coming seasons. Has played occasional run-with roles, most notably on Adelaide star Rory Sloane last year, and the former defender appears comfortable in his midfield role. Sign him up: Oscar McDonald. The 22-year-old has taken his game to another level in 2018, flourishing after assuming the mantle as Melbourne's No.1 key defender. Stronger in one-on-one contests this season and more assured with the ball in his hand, McDonald has played the most game time of any player in the competition after six rounds. Shapes as a key member of the Demons' team over the next decade. Sign him up: Ben Jacobs. The AFL's stingiest tagger has made a seamless return this season after missing most of the previous two years with foot injuries, quickly underlining his importance to North's midfield. Jacobs' victims this year have included Seb Ross, Patrick Cripps, Tom Mitchell and Clayton Oliver, while he has also averaged more than 15 possessions a game. If Jacobs can maintain his fitness and form, North will gladly reward him with a new deal. 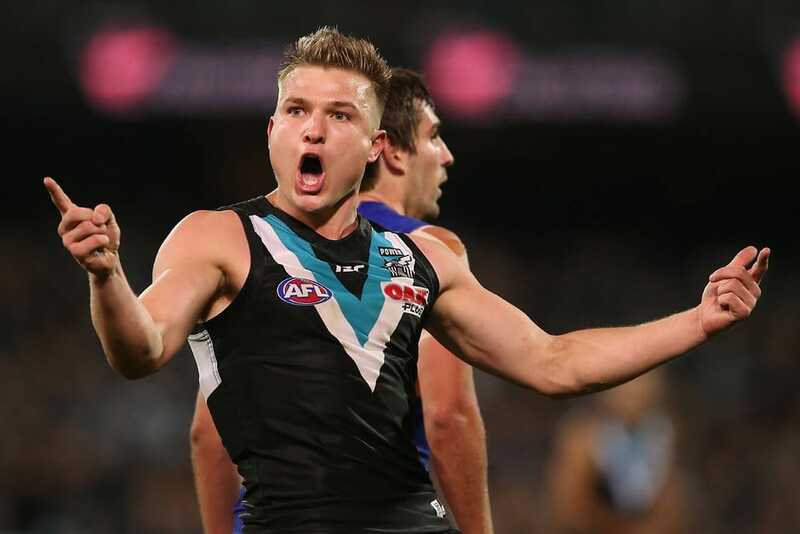 Sign him up: Ollie Wines. The contested bull would generate feverish interest in his home state, Victoria, if he decided to test the market, but he is not about to leave Alberton. Both parties are supremely confident a new deal will get done, but it could take a while to sort out the fine print. Wines is equal fourth in the AFL for clearances (7.3 a game) after six rounds and appears the leading contender to succeed Travis Boak as Power captain. Sign him up: Shai Bolton. Since being taken at pick No.29 in the 2016 NAB AFL Draft, the livewire small forward has played just eight senior games, including this year's opening two rounds. However, given time, the silky-skilled West Australian has the class to force his way into Richmond's powerhouse line-up. Managed by Dustin Martin's mentor, Ralph Carr, Bolton has put off contract talks with the Tigers until the end of the season, but he is understood to be happy at Punt Road and enjoying living in Melbourne. Sign him up: Billy Longer. The former Lion re-established himself as the Saints' No.1 ruckman last year after a difficult 2016 season. Longer has made a slow start to 2018 following an injury-interrupted pre-season – he was dropped after the opening two rounds – but turns 25 later this month so his best football should be ahead of him. In Longer and Tom Hickey, St Kilda has two capable senior ruckmen, giving them big-man depth that some clubs lack. Sign him up: Sam Naismith. It was a huge blow for the Swans when the 25-year-old ruptured an anterior cruciate ligament at pre-season training in March, especially after fellow big man Kurt Tippett's retirement little more than a month earlier. Naismith shouldered the bulk of the Swans' ruck duties last year and his season-ending injury has thrown enormous responsibility on to the club's last ruckman standing, Callum Sinclair. The Swans won't have any hesitation offering Naismith a new deal, allowing him to focus on his rehabilitation ahead of 2019. Sign him up: Brendon Ah Chee. The Eagles have a stacked free agency list to deal with, but list manager Brady Rawlings has already addressed many of the club's out-of-contract priorities, re-signing Elliot Yeo, Liam Duggan, Jamie Cripps, Jack Redden, Nathan Vardy and Jake Waterman over the past few months. Nonetheless, West Coast will be hoping Ah Chee, 24, can make the most of a fresh start after crossing from Port Adelaide in last year's trade period. The big-bodied midfielder joined West Coast on a one-year deal and will try to extend his stay with a strong 2018 campaign. Sign him up: Zaine Cordy. Like the Eagles, the Bulldogs’ focus will be on retaining their long list of free agents, but they will also be keen to lock Cordy away. At 193cm, the 21-year-old defender can play on talls – last year his opponents included Joe Daniher, Gold Coast's Tom Lynch and Giant Jonathon Patton – and smalls. He finished equal seventh in last year's best and fairest award and shapes as a long-term replacement for veteran Mr Fixit, Dale Morris.